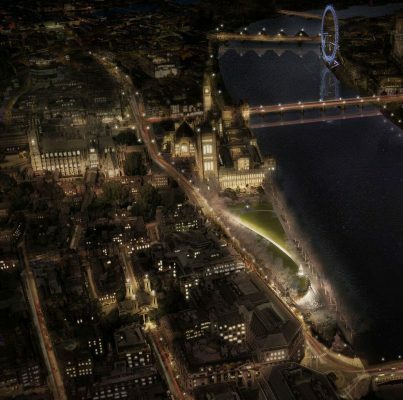 Unesco’s official adviser on World Heritage Sites has objected to the planned Holocaust Memorial Centre next to Parliament, saying it would “interrupt substantially” the park’s views of Westminster Palace. 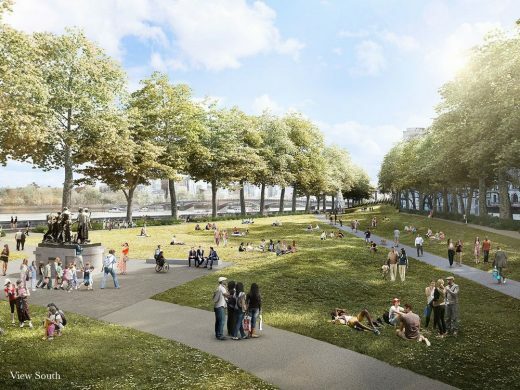 The International Council on Monuments and Sites (ICOMOS), which Unesco founded and is one of three formal advisory bodies to its World Heritage Committee, wrote to Westminster Council opposing the application to build the memorial. It claimed that the constructing it there “would have a massive visual impact” because it would kill a number of trees in Victoria Park Gardens. Adjaye Associates, Ron Arad Architects and the landscape architects Gustafson Porter + Bowman have been selected to design the UK’s new Holocaust Memorial and Learning Centre. After an international competition, with 92 entries in total and ten finalists, Adjaye Associates, Ron Arad Architects and Gustafson Porter + Bowman were selected unanimously as the winning team, by a Jury including the Secretary of State for Communities and Local Government, the Mayor of London, the Chief Rabbi, experts from architecture, art and design, and both first and second generation Holocaust survivors. The design team will be led by British architect Sir David Adjaye, who is known for creating sensitive yet compelling designs. His recent work includes the National Museum of African American History and Culture in Washington D.C. and the Idea Stores in London’s Tower Hamlets. 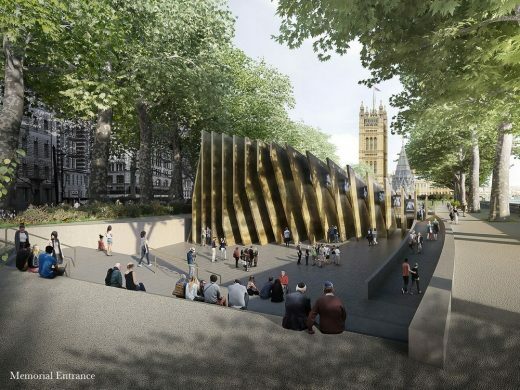 Located next to the Houses of Parliament in Westminster, the new UK Holocaust Memorial will honour the six million Jewish men, women and children who were murdered in the Holocaust, and all other victims of Nazi persecution, including Roma, gay and disabled people. 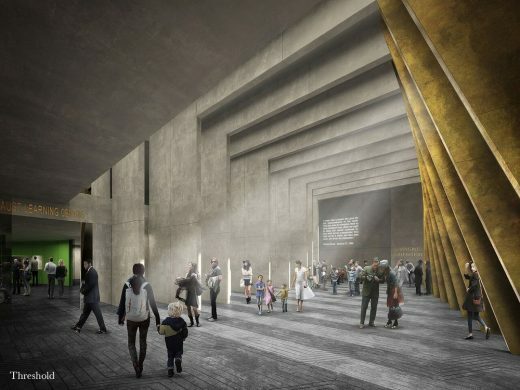 Its co-located Learning Centre will contextualise the Memorial above and use the stories and facts of the Holocaust to explore anti-Semitism, extremism, Islamophobia, racism, homophobia and other forms of hatred and prejudice in society today. From its location next to Parliament, it will ask questions about the role of society and its institutions in encouraging respect for others and preventing hatred. The Jury praised the winning team’s proposal to create “a living place, not just a monument to something of the past” and the desire to create an immersive journey for the visitor who would enter a Memorial embedded in the land. The winning concept is at an early design stage. It will now undergo further development through discussion with Holocaust experts, survivors and other victim groups, and local residents, Westminster City Council, Historic England, Royal Parks and other statutory consultees. As part of this process, the United Kingdom Holocaust Memorial Foundation will also work closely with other organisations and experts on the contents and approach of the co-located Learning Centre. The Jury also awarded honourable mentions to two teams – heneghan peng architects and Sven Anderson, and Diamond Schmitt Architects. 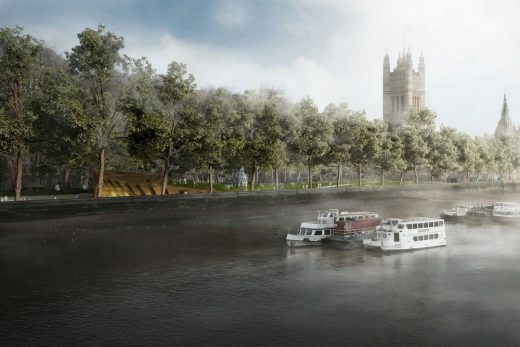 The winning design concept was inspired by research into the site, Victoria Tower Gardens, next to the Houses of Parliament, with Sir David Adjaye describing the location as a “park of Britain’s conscience”. The Memorial links with the statue of Emmeline Pankhurst, the Burghers of Calais and the Buxton Memorial: all four recognising injustice and the need to oppose it. In order to keep the park as a park and to maintain the green space, the team placed its Holocaust Memorial at the far southern end of the Gardens, embedded in the land. 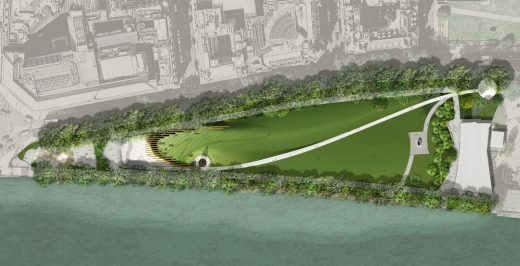 Accordingly, a visitor approaching the Memorial would see a subtle grass landform with only the tips of the Memorial’s fins “bristling in the distance”, its intriguing design giving a sense that something is happening underground and encouraging people to find out more. 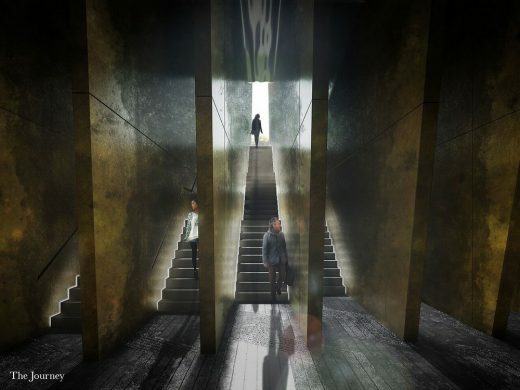 The design concept takes visitors on a journey that culminates in confronting the 23 tall bronze fins of the Memorial, the spaces in between representing the 22 countries in which Jewish communities were destroyed during the Holocaust. Entering the Memorial would be a sensory experience. While the outside and inside space emphasises collective gathering, the 23 bronze fins require the visitor to enter in an isolated, solitary way, each pathway planned as a different experience. Each path eventually leads down into the Threshold – a generous hall which acts as a place of contemplation and transition into the Learning Centre below ground. The Learning Centre includes a “hall of testimonies” and a “Contemplation Court”: a silent, reflective space with eight bronze panels. On leaving the Memorial, the circulation route ensures visitors will emerge to see the classic uninterrupted view of Parliament – and the reality of democracy. We were privileged to see submissions from some of the best teams in architecture, art and design today. On behalf of the Jury, I would like to thank all teams for their impressive submissions. The Jury was unanimous in awarding this competition to Sir David Adjaye and his highly skilled and passionate team. 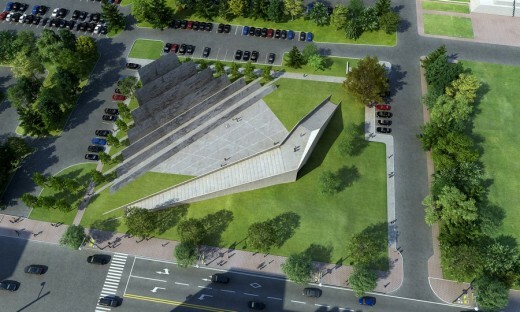 Their ability to use architecture to create an emotionally powerful experience, their understanding of the complexity of the Holocaust and their desire to create a living place as well as a respectful memorial to the past and its surroundings, will combine to create a new national landmark for generations to come. We look forward to working with them on this nationally significant project: a statement by the British people that our nation will remember those who suffered, and that we will always strive for a better future. The complexity of the Holocaust story, including the British context, is a series of layers that have become hidden by time. Our approach to the project has been to reveal these layers and not let them remain buried under history. To do so, we wanted to create a living place, not just a monument to something of the past. We wanted to orchestrate an experience that reminds us of the fragility and constant strife for a more equitable world. We are deeply honoured to have been given the opportunity to tell these stories to the nation through a National Memorial and Learning Centre. It is critical these highly important and emotive historical touchpoints are explored, so that future generations are able to experience, learn, reflect and act. Ben Helfgott MBE, President, 45 Aid Society, Holocaust Survivors and President HMDT, British Olympic Weightlifter and Jury member, said: I have spent each and every day since I was liberated in 1945 remembering my family and friends, and all of the victims of the Holocaust who were murdered by the Nazis. With fellow survivors in the 45 Aid Society, and with our children and grandchildren, I have sought to tell and retell the painful history accurately and in context, and to make sure we use the tragic experience to fight for justice and the rule of law, and to spread the message of tolerance. I am very proud of my involvement in the many key Holocaust education projects in the UK over recent decades, none more so than this vital UK national Memorial and Learning Centre in its uniquely significant location next to the Mother of Parliaments. As we – the youngest survivors – pass on the baton of Remembrance, we are delighted to see this wonderful design team deliver a Memorial and Learning Centre which will resonate for generations. Congratulations to Sir David Adjaye and his team on this stunning, inspiring, sobering concept for the UK’s new Holocaust Memorial and Learning Centre. Constructed right in the heart of our democracy, it will be a lasting tribute both to those who died and to those who survived. Through this project, we stand up as a nation; we stand together regardless of our religion, race or background; and we stand against ignorance and bigotry. The new Learning Centre will not only remind us of mankind’s capacity for darkness, through the story of the Holocaust and other genocides – crucially, it will also remind us of our incredible capacity for good. Congratulations to Sir David Adjaye and his team on an exceptional winning design for the UK’s Holocaust Memorial and Learning Centre. The standard of entries were incredibly strong, but David’s stood out for its beauty and sensitivity. This unique and immersive memorial is not just for Londoners, but for the whole UK. It will ensure the horrors of the Holocaust are never forgotten and will stand as a powerful reminder to future generations about the fragility of peace. I look forward to working with the UK Holocaust Memorial Foundation as the project develops. The question of how we will memorialise the Holocaust in the years to come, in a society which will no longer be able to rely on first-hand testimony of survivors, is one that should occupy the mind of every one of us. Today, the British nation has taken an important and historic step in offering our answer to that question. 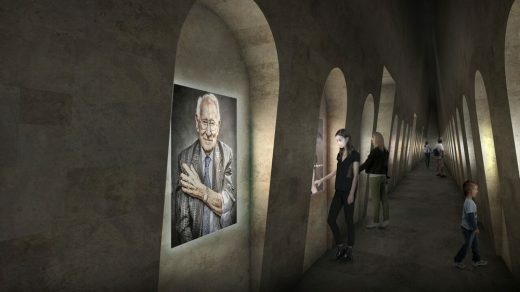 The outstanding winning concept will provide an entry point for a greater national understanding of the Holocaust and its contemporary relevance. This timely memorial will encourage and inspire peaceful coexistence and tolerance and will lead to a better appreciation of what can happen when hatred is allowed to develop unchecked. It was a privilege to be a part of the judging panel for such an extraordinarily important and influential project. The quality of the entries was extremely high and the expertise of the winning team exemplified all that is best about British design creativity and talent, for which we are renowned. The bold and sensitive collaboration between architecture, landscape architecture, art and design from such a multi-faceted and award winning team truly captured our attention. But also the seriousness with which the team approached the brief and the responsibility they saw they had to carry the messages from this terrible history on to the generations to come. Sir David Adjaye described the core of their concept during the interviews as being ‘architecture as emotion’. That powerful and resonant core is one I very much look forward to seeing develop and come to fruition for all of us to experience. What better way to show that we will not tolerate hatred than our new Holocaust Memorial, right next to our Parliament. There is no location more fitting to honour the victims of one of humanity’s greatest tragedies than side-by-side with one of humanity’s oldest democracies. No better way to strengthen education initiatives up and down the country. Today we stand up as a nation and say to each other, and to the world, that there is no place for hate in our society. There is no better gift we can pass to future generations than the knowledge of where hatred, unchecked, can lead. Firstly, I would like to congratulate David Adjaye and his team on being awarded this hugely significant, and emotionally charged commission. A commission requiring not only sensitivity to the subject matter, but also the surrounding landscape and adjacency to Parliament. The team’s proposals for a ‘sensory experience’ were expressed passionately and convincingly in their presentation. This core objective from the concept designs must sit at the heart of the development stage that will now start in discussion with stakeholders as the project moves forward. The Jury awarded heneghan peng architects and Sven Anderson an honourable mention for an original and engaging design that brought the testimony and voices of survivors to the foreground. 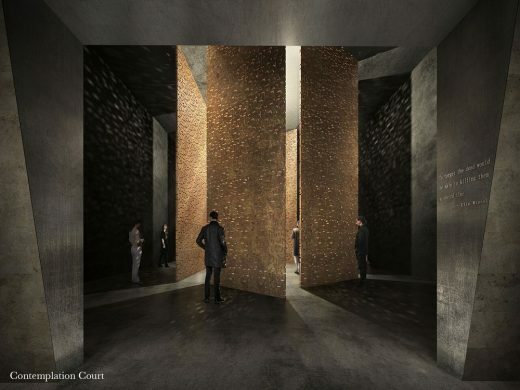 The team’s triangular sunken courtyard was imagined as an ‘ear’ that listened up to Parliament and down to the Memorial – the stone walls punctured with a series of small apertures containing wooden blocks which emitted the voices of survivor testimony. The team intended the Memorial to be a place to hold the testimonies “with nothing in between to create a heightened sense of listening, pause and reflection”. The Jury also awarded an honourable mention to Diamond Schmitt Architects for an elegant, restrained design and an impressively rigorous and detailed approach. Centred on the idea of a journey from light to dark and dark to light, the Memorial created a void in the Gardens intended to symbolise loss and absence. The elliptic walls of the Memorial were inscribed with the names of the concentration camps, and the six million victims commemorated through a series of ingots impressed into the cast-iron structure, a reference to Britain’s manufacturing history. During the competition, which was managed by Malcolm Reading Consultants, the ten shortlisted designs were displayed online and in various exhibitions across the UK, including a three week exhibition at the Victoria and Albert Museum in London. Consultation events were also held with Holocaust survivors, the Roma community and education experts. The final design will be subject to planning approval. Subject to the planning process, the Memorial and Learning Centre are due for completion by 2021. Paul Williams OBE, Stanton Williams Architects. The Jury was advised by Competition Director, Malcolm Reading. With cross-party support, the Government has committed £50 million for the UK Holocaust Memorial Foundation to take forward the recommendations of the Commission. In addition to the government funding, the Foundation will fundraise additional contributions to deliver the National Memorial and Learning Centre and its broader educational objectives.